Allliteration can easily get out of control, can't it? Please forgive me. Sorry for the blurry photo, but maybe you can guess what these are through the blur. Those are the keys from my grandfather's typewriter. The clickity-clack, clackity-click, ding and slide were common sounds of my childhood and reminders of lazy summer days spent at their house. My grandfather, Archie, used it all the time because he did not think his handwriting was neat enough. He even typed me letters on it when I was in college (I can't seem to find them, which hurts my heart, but am optimistic they will turn up somewhere someday). I've held on to it for years, not really wanting to part with it, but not displaying it either. Last week Scott brought it in from the garage, cleaned it up a bit and now it's sitting on top of our TV armoire in our family room. If I was really inspired and industrious, I could spruce it up with some paint or something. But I'm not. It makes me happy sitting up there just the way it is. 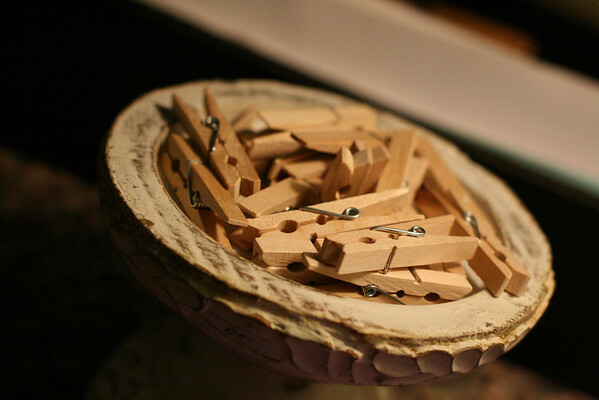 I used some small clothespins to hang pictures on our Christmas tree this year and then on our wire photo collage. Instead of putting them away in an organized fashion and place, I left them on this little pedestal. Don't ask me why, but now they make me smile. 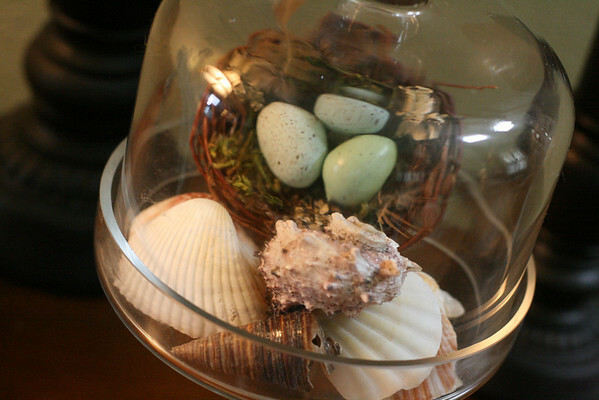 Since spring is right around the corner, I got my little bird nest out, but this time added some sea shells under the dome too. Pleasant, no? Venturing into Annelise's territory (her room and her bathroom) can either trigger frustration by the disarray or smiles, depending of course on my mood. Today the disarray was not too bad, so I smiled and grabbed my camera to document some of her world. She has been playing with her Barbies in her baths lately, so I am always finding various nekkid bodies sprawled on her bath mat. This morning featured Troy and Gabriella from HSM (gasp!). I covered them with a towel for modesty's sake. Maybe I should buy her dolls some swim suits? 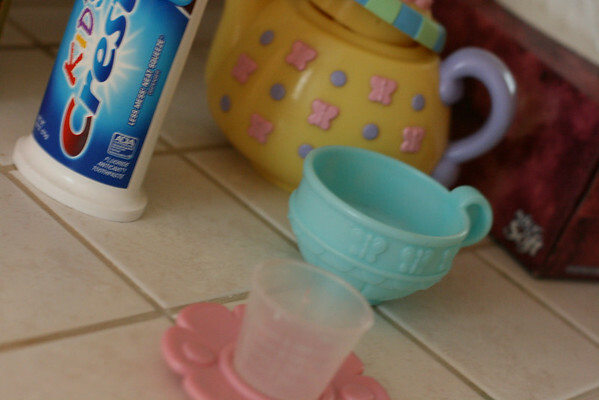 Instead of brushing her teeth in a timely manner each morning before school, I guess she's been having impromptu tea parties. 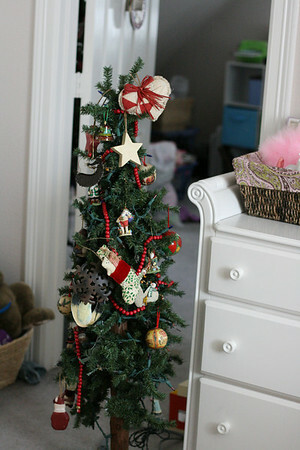 And, I'll just go ahead and put this out there, she still has the Christmas tree she decorated up in her room. She uses it as a sort of nightlight. 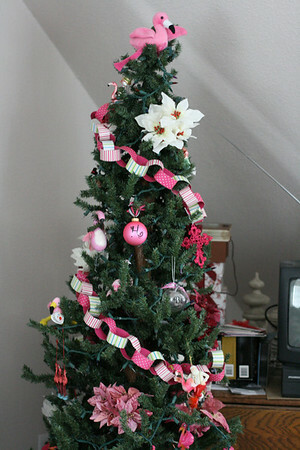 I can't really say anything because this year I decided to leave my flamingo tree up in my craft room to bring year round pink cheer and enjoy flamingos all year. 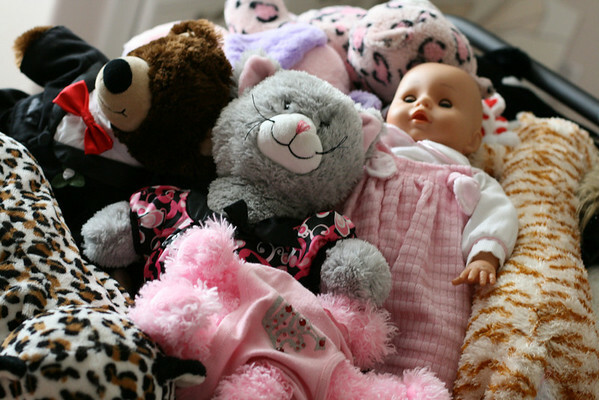 And, finally, do your children sleep under a mountain of stuffed animals too? There is usually a pile like this at the foot of her bed, so she has to sleep curled up in a ball, but that's how she likes it. Oh, and by the way, the grey cat (Kit, because she is patiently waiting for an American Girl doll someday) and the brown bear in the tuxedo (Cocoa, who previously was a girl bear but is now possibly gender confused because last Friday Annelise decided Cocoa was a boy after all) went to prom and will get married when they are thirty two. Since I don't quite know how to cleverly close a post about a typewriter, clothespins, nekkid barbies and flamingo Christmas trees, I'll just bid y'all adieu and stop this miscellany madness. Hope your Monday has been merry! It's very merry after reading this post! Good to see your flamingo tree! Holly.....awesome post! I have 2 pair of shoes that were my grandmother's from the 1940's displayed in my house. Much like the typewriter, they make me smile! Oh....for Barbies....you can always paint underclothes on them with nailpolish! Cute photos! You know what I've been wanting? 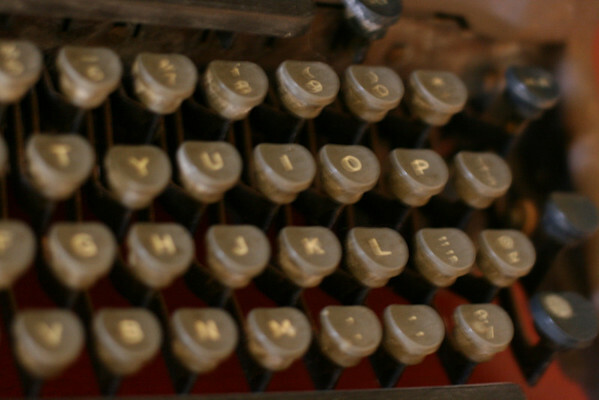 An old typewriter. You know why? To use for journaling on scrapbook pages. It gives them a distressed, unique look. 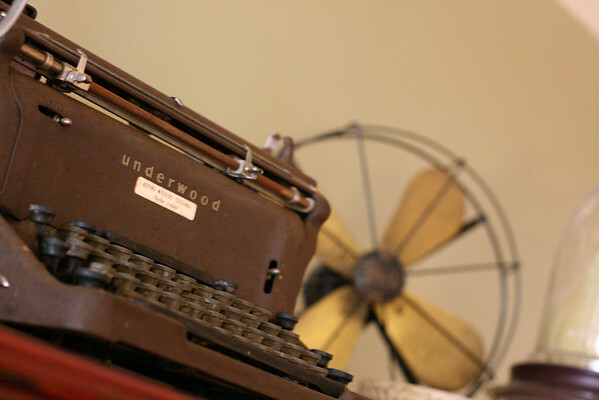 Maybe you could use Archie's typewriter for journaling something about him. Love that you have that and that's it's prominently displayed. Don't you just love old things that have sentimental value! ?